Is it possible to combine desire for variety in sexual relations with the maintenance of a stable, happy marriage? FROM time to time one reads in the newspapers reports of cases such as that of the Percy Radfords and the George Hauses, of St. Louis, Missouri. These two couples, after a friendship of four months, decided they’d be happier married to each other’s partners. At the time the swap was made, one couple had been wed for some seventeen years, and the other for almost five. Accomplished as it was, through divorce and remarriage, this trade of spouses had legal sanction, as well as the attention of the press. But there is a lot more such swapping than the newspapers ever discover, because most of it exists on a sporadic basis and does not end in divorce and the remarriage of the alternate couples. Just recently, for example, I learned of two young men, instructors at a large university, who lived quite circumspectly, each with his own wife, during the academic year. The two couples spent summers together in a cottage they rented jointly, where they split up, each man spending the vacation with the wife of the other. When this unconventional arrangement was brought to the attention of the university officials they responded with about the degree of enthusiasm you’d expect, and both men were hastily fired. Had the two young couples been members of the Banyankole tribe of Central Africa their exchange of mates would have inspired neither comment nor disapproval. Among this people, as among the natives of the Hawaiian Islands, it was the custom, when a man and his wife visited a friend, for the couples to exchange wives for the duration of the visit. William J. Fielding, in Strange Customs of Courtship and Marriage, tells us also that, when the Himalayan mountaineers became disgusted with their mates, they would exchange wives, in the hope that this would improve their domestic lives. But what of our American society, with its ideal of monogamy and fidelity in marriage? How common is the exchanging and loaning of wives among us? And why? For one thing, it is more common than most people seem to think. Nor is it limited to men who seek a change of bedfellows. There are women, too, who desire such “swaps” and who take the initiative in arranging them. The temporary exchange of mates is sometimes merely a device to provide variety in the sexual life. 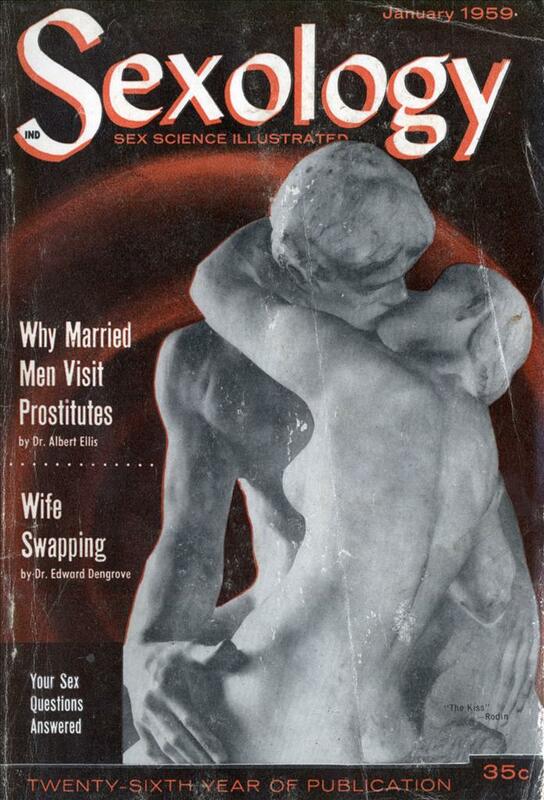 We have been somewhat acceptant of the idea that desire for change is a natural desire among menâ€”perhaps no one was too surprised when Dr. Kinsey revealed that three-quarters of the men interviewed for The Sexual Behavior Of The Human Male said they sometimes wished to have relations with women other than their wives. And the Kinsey report disclosed that at least one-half of all married men realize that wish. As the Kinsey report on women showed, that wish is not solely a male one. One of every four women interviewed had at least one extramarital affair by the time she reached her fortieth birthday. And all the evidence would indicate that there are many more who sometimes hanker for a husband other than their own. Often, the desire for another person’s mate, and the willingness to trade one’s own, arises from far more complicated motives than the simple longing to add some “spice” to a marital routine grown dull. There are many men and women who are unsure of their own worth as human beings, and who need constant reassurance and approval from others. Such people frequently lend themselves to this kind of arrangement. Just the other day, a woman was complaining to me that at gatherings of the social group to which she belonged, men would invariably make sexual “passes” at every attractive woman. “What I can’t understand is the attitude of their wives,” she said. These are the wives who doubt their own attractiveness as women, and their husbands’ worth as men. If other women find her mate attractive, such a wife feels reassured that she has made a wise marriage choice, and she also feels that she must be pretty “special,” too, to have first claim on so desirable a man. On the other hand, if no other woman wants her husband then her ego is deflatedâ€” she sees herself as a rather worthless creature, capable of marrying only the kind of man other women spurn. Sometimes, the reasons for this type of attitude on the part of the marriage partner reach hack into childhood experiences. Mary A., an attractive young wife, complained that her husband never objected when other men made advances to her, and even encouraged her to invite them. Although Bill did not realize it, that little-boy rivalry played a part in his choice of Mary as a wife. She was an exceptionally pretty girl, and when other men gave signs of their interest in her, Bill felt that in one respect he had managed to outshine his brother. He had a far more desirable wife, and for the first time could make other men â€” and, he fondly imagined, his brotherâ€”envy him! Not too long ago, I was consulted by a couple trying desperately to save their floundering marriage. The husband was particularly disturbed by his wife’s erratic sexual behavior. In consultation with his wife, I learned that she felt herself physically attracted to one of her husband’s friends. She had even suggested to her husband that he and his friend arrange a temporary “trade”â€”giving her to the other man and the friend’s wife to her husband. Flabbergasted, he refused to discuss the idea. But she did date other men without his knowledge, and they were always married men. “It makes me feel young again,” she said. It also increased her desire for her husband. After such an affair she regained her interest in the marital union. Without these temporary liaisons, she was quite frigid. Her father had died when she was young, and her mother had remarried. She had always felt a great attraction towards her stepfather, and when she was nine years old he had seduced her, an experience she found exciting. Her promiscuity was an attempt to recreate her image of herself as the young, desirable girlâ€”and the men were always married, as her stepfather had been. Among the Polynesians this would have been accepted social behavior, but he was not a product of Polynesian culture. Actually, this husband had latent homosexual desires, and though he was not fully aware of it, he was having vicarious sexual relations with his friend every time he sent his wife to sleep with him. And latent homosexual desires may also account for the willingness with which some women permit their husbands to indulge in similar affairs. Sometimes, a wife will agree to a swap of mates more to gain the vicarious thrill which comes with knowing her husband is having relations with a woman she is attracted to, than for any desire she feels for the other man. The editor of Sexology recently received a letter from a reader who explained that his wife insisted that he have relations with a young woman who boarded at their home. This despite the fact that they had been married for eight years, and seemed to be well adjusted sexually. In his own case, such a practice can lead only to a more and more distorted sexual relationship, which might very well result in his wife’s becoming completely frigid. The sooner he finds competent help for her and persuades his wife to accept it, the better. Unless she can be made to understand the reasons for her behavior and can be helped to overcome it, her sexual life and her marriage will only grow increasingly disturbed. 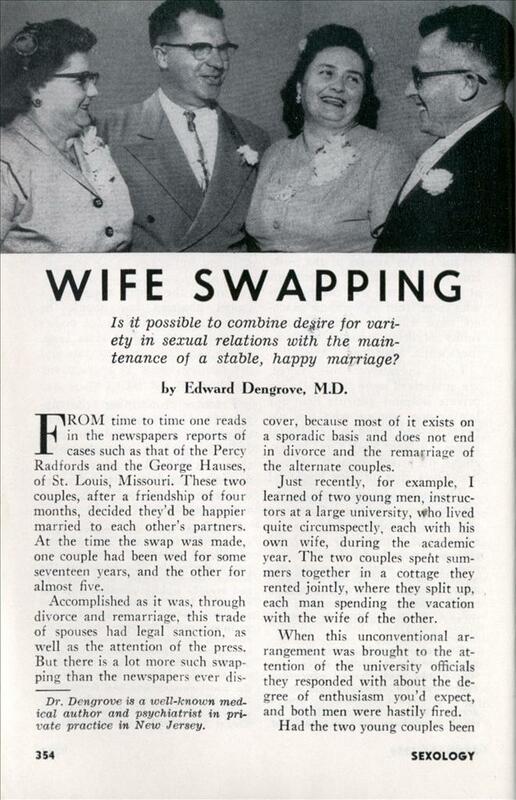 Dr. Kinsey noted that among the “not inconsiderable group of cases” studied in which the husbands had encouraged their wives to engage in extra-marital activities, there were a number of deviations involved. These included homosexuality, desire to “peep,” and sadistic satisfaction obtained from forcing a wife into such a relationship. But he emphasized that most often wife swapping represented a deliberate effort to extend the wife’s opportunity to find satisfaction in sexual relations or a desire of the husband to find an excuse for his own extra-marital activity. Dr. Kinsey also pointed out that his investigators had seen instances where husbands and wives appeared to accept their partners’ extra-marital activity frankly and whole-heartedly at the beginning. Years later, however, the old extra-marital relationship cropped up to become a source of considerable conflict. This often resulted from the development of some insecurity on the part of the other spouse. or changed circumstances in the couple’s life. The Kinsey investigators drew this conclusion from their data? : that reconciling the individual’s desire for coitus with a variety of sexual partners and the maintenance of a stable marriage, presents a problem which has not beer) satisfactorily resolved in our culture. “Can marital stability be maintained in the face of extra-marital relations on the part of the husband or wife?” asks Dr. Abraham Stone, one of America’s most noted marriage consultants.